Grilled meat is a big part of summer in the United States. Cookouts and family barbecues serve up hamburgers, hot dogs, steaks, and chicken for the perfect weekend summer meal. For years, there has been controversy over whether grilled red meat and chicken could cause cancer. This subject has been circulated online as being true and false, and there have even been conflicting reports in the news. What do we believe? 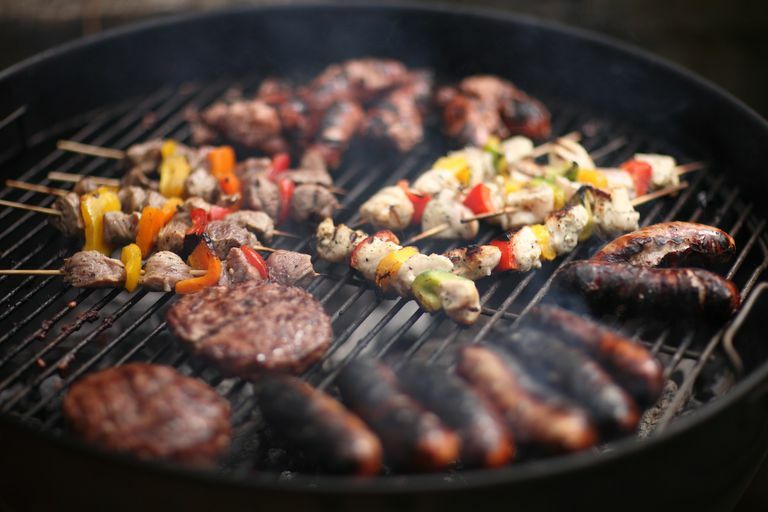 Keep reading to learn not just why and when grilled meat may be a problem, but what you can do to reduce the number of carcinogens in the meat you grill—so you can enjoy those summer barbecues without feeling guilty. Does Grilling or Barbecuing Meat Cause Cancer? Studies have found that eating grilled meat or chicken may increase your risk of developing cancer. The problem comes down to carcinogens, cancer-causing substances which may be formed as part of the grilling process. The amino acids, sugars, and creatine in meats react at high temperatures forming heterocyclic amines. Heterocyclic amines (HAs) are human carcinogens found on any meat cooked at high temperature, whether on a grill or in a pan or under the broiler. Part of the problem is the grilling, but the other is simply the heat. Pan frying meats at high temperatures (over 300 F) also appears to increase cancer risk. Meanwhile, polycyclic aromatic hydrocarbons (PAHs) form when the meat juices drip onto the coals or other heating surfaces and flare up in flames and smoke. They stick to meat and are only found on grilled or smoked meat. HAs and PAHs are mutagenic—they cause changes in the DNA of cells in the laboratory that could lead to cells becoming cancerous. The most important factor in PAH production appears to be the incomplete combustion of fats which drip on the grill. We don't have any direct studies on humans which show that HAs and PAHs cause cancer, but animal studies have found an increased risk of cancer in exposed animals. Population studies on people, in turn, have found an increased risk of some cancers in people who eat larger quantities of grilled and well-done meats. While most studies have focused on grilled meat and the incidence of cancer, a 2017 study found that women with breast cancer had lower survival rates if they consumed greater amounts of grilled, barbecued, or smoked meats. Marinating meat - Marinating meats for 20 minutes prior to grilling may reduce the formation of heterocyclic amines by up to 90 percent. Check out these food preparation techniques for lowering carcinogens in well-done meats. Cooking at lower temperatures - Experts recommend that foods be cooked at lower temperatures, even though this means cooking them for a longer period of time. Using a gas grill if possible - If you prefer using a charcoal grill, purchase a fire chimney (or make your own out of an old coffee can) so that you can avoid using lighter fluid. Making sure the flames die down before putting meat on the grill. Raising the grill rack - On a gas grill, raising the grill rack, away from the heat, may be helpful. You can also use indirect cooking techniques for meats on the grill, keeping the flames away from the food and using the grill as an oven. Choosing the right charcoal. While charcoal type doesn't seem to make a large difference with red meats, salmon which is grilled with coconut shell charcoal develops significantly fewer HAs and PAHs than salmon grilled with wood charcoal. Do Grilled Vegetables Form Carcinogens? The answer is no. What we've learned about grilled meat doesn't pertain to grilled vegetables. Vegetables don't contain creatine, the protein which can be turned into heterocyclic amines, and do not have the juices meats do which can drip onto coals. So add all of the potatoes, red, yellow, orange, and green peppers, zucchini, onions (rich in quercetin), mushrooms, and any other vegetables you enjoy, to the grill. You may use a grill basket, or whatever method you prefer. In fact, many people who don't particularly enjoy vegetables alone, savor the taste of marinated and lightly seasoned grilled vegetables. Don't forget the spices. Many people forget that the spices we add to our foods can pack a healthy anti-cancer punch. Better yet, grow some fresh basil, thyme, rosemary, and sage in a container on your deck next to your grill. Chop some of these spices to add to your grilled foods. According to the International Agency on Research of Cancer, it appears to be wise to limit your intake of red meats, whether grilled or cooked in any fashion. You may see recommendations talking about how many ounces you should eat, but unless you weigh all of the food you eat, this isn't really practical. Instead, there are a few simple rules to follow. Limit the meat on your plate to the size of a deck of cards. Divide your plate into thirds. Meat products should take up one-third of your plate or less. Fill the other two thirds with cancer-fighting foods such as cruciferous vegetables (high in glucosinolates) and green leafy vegetables. Ideal choices include broccoli, cauliflower, kale, radishes, and cabbage. Using skewers is also an excellent way to limit the amount of grilled meat consumed during a meal. Small pieces of meat, combined with fresh fruits and vegetables on the grill make for an attractive and delicious meal. As for the hot dogs, you may want to take a pass. We know that, of all meats, processed meats likely confer the most cancer risk. Since you will already be limiting both the frequency and portion size of the meats you eat, might it not be best to save those portions for cuts of non-processed meats you can truly savor, such as a good (but marinated) steak? We know that high cooking temperatures and smoke put mutagenic chemicals into and onto meat. Yet, there are several measures you can take to reduce the number of heterocyclic amines and other carcinogens in the meat you eat. Keep in mind that just like everything in life, moderation is key. You still can enjoy grilled meats, but just do so in moderation and when cooked at low temperatures. That said, women who have had breast cancer may want to limit the amount of grilled, barbecued, and smoked meats they consume, even if they take the measures above to reduce carcinogens. Finally, instead of thinking about only what you need to avoid, you may wish to reframe and think about the foods you can enjoy which may instead reduce your risk of cancer. Limiting processed foods and red meats can help ward off cancer risk. These recipes focus on antioxidant-rich foods to better protect you and your loved ones. Sign up and get your guide! Lee, J., Kim, S., Moon, J. et al. Effects of Grilling Procedures on Levels of Polycyclic Aromatic Hydrocarbon in Grilled Meats. Food Chemistry. 2016. 199:632-8. Parada, H., Steck, S., Bradshaw, P. et al. Grilled, Barbecued, and Smoked Meat Intake and Survival Following Breast Cancer. Journal of the National Cancer Institute. 2017. (Epub ahead of print). Viegas, O., Novo, P., Pinto, E., Pinho, O., and I. Ferreira. Effect of Charcoal Types and Grilling Conditions on Formation of Heterocyclic Aromatic Amines (Has) and Polycyclic Aromatic Hydrocarbons (PAHs) in Grilled Muscle Foods. Food Chemistry and Toxicology. 2012. 50(6):2128-34. What Foods Should You Eat to Prevent Colon Cancer? What Are the Risk Factors for Lung Cancer? Are There Breast Cancer Risks Linked to Pregnancy or Abortion? Does Hookah Smoking Cause Cancer? What Are the Chances That a Lung Nodule Is Cancerous? Does Using Splenda or Sucarlose for a Sweetener Cause Cancer?